I’m not going to get into whether this statement is true or not, but it’s simply not something that the Buddha said. Both the sentiment and the vocabulary are totally alien to the Buddhist scriptures. It sounds more like something from a modern self-help or spirituality book. But which one? That’s a mystery. In fact it doesn’t show up in any books on Google Books at all. Perhaps it’s in a book they haven’t scanned, or perhaps it originated in a video or blog. It seems to be quite new. 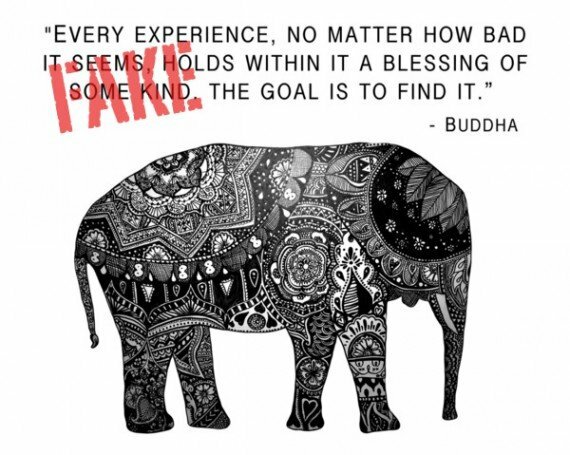 I spent a while looking through the Google search results for this quote, and the earliest uses of the quote that had dates on them were from an internet profile dated September 12, 2010 (not attributed to the Buddha), and a blog post dated June 11, 2008 (where it does purport to be a Buddha quote). Where did the authors of these pages get the quote from? I simply don’t know. …we always have a choice. We can become bitter or we can choose to become bigger and better people. When we learn to recognize that every experience can bring a blessing of some kind, our upset is softened. When you begin to look for reasons to believe that every experience is a blessing, you will start to find those reasons. …the wise man knows that every experience is to be viewed as a blessing. But I doubt if any of these is the source. These various books are merely restating a meme that is common in our culture. If you ever find a book or magazine prior to 2008 that contains the full quote, or something similar to it, please let me know. I’ll leave you though with the blessing of the Dharma: some words (on the topic of “blessings,” in fact) from the Mangala Sutta. We never know. Maybe he said that to a friend, and this friend kept the secret into his own family only, and then, centuries later, his decendents decided to put it in a Shirt. Why not? So you’re suggesting that a spiritual teacher has said something to one person (something that, incidentally, bears no relation to anything else he’s said), and then that person’s descendants have passed on the saying for 2,500 years, without mentioning it to anyone else and with no errors in transmission despite the fact that the language of the original quote is now dead, until finally one of the descendants decides to translate the saying into English and publish it on a t-shirt? And this sounds likely to you? More likely than a quote having simply been misattributed to the Buddha?